As an Assistant Engineer in Medical Engineering, I’m involved in a number of collaborative projects to design engineering solutions to biomedical problems. At the moment, my efforts are focused on the development of open-source optical tomography hardware for selective plane illumination microscopy (OpenSPIM) with mentorship from Kevin Eliceiri, Morgridge Medical Engineering and LOCI Scientist Jayne Squirrell and LOCI Instrumentation Innovator Julie Last with assistance from Mechanical Engineering undergraduate Rahul Mehta. As a Research Assistant in the Medical Physics Department at the University of Wisconsin-Madison, I focus on developing tools for multi-modal measurement of tumor metabolism, both in vivo and in vitro. 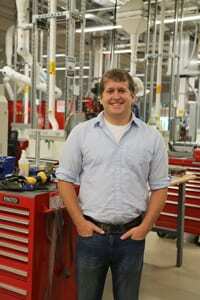 Along with Kevin Eliceiri, I am advised by Sean Fain, Medical Physics. We collaborate on this project with several researchers, including Patti Keely, Cell and Regenerative Biology; and Hirak Basu, UW Carbone Cancer Center. 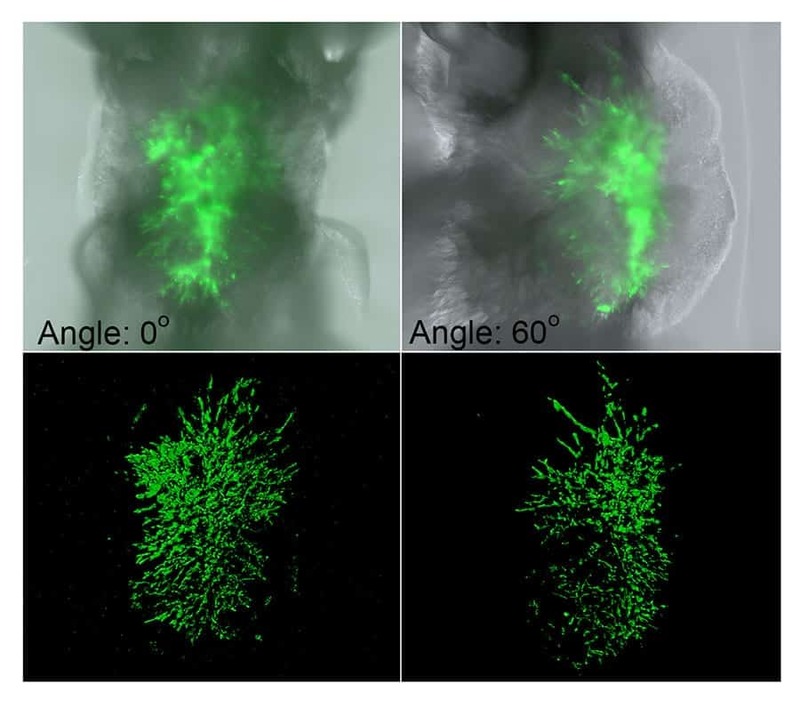 Z projections of SPIM z-stacks at 2 angles showing fungal growth in an immune-compromised zebrafish larva. 3D surface rendering (Imaris) emphasizes hyphal structure and provides volumetric data assessment. Image taken on SPIM at the Laboratory for Optical and Computational Instrumentation by Jayne Squirrell for Anna Huttenlocher in the Department of Medical Microbiology and Immunology at the University of Wisconsin-Madison. In the last two decades, optical imaging techniques, like fluorescence lifetime imaging (FLIM), have emerged that can provide cellular information about metabolic changes. In addition, a whole-body magnetic resonance imaging (MRI) technique, magnetic resonance spectroscopic imaging (MRSI) of molecules enriched with hyperpolarized 13C atoms can provide macroscopic information about pyruvate metabolism and lactate production. While this new metabolic information is critical to tumor diagnostics, its clinical use is hindered by major technological challenges. We are developing and validating multimodal imaging of metabolism in vitro. This open-source platform will be custom designed and compatible with magnetic resonance spectroscopy (MRS) and PET of cell cultures to validate metabolism imaging using 13C MRI and/or FDG-PET with optical methods, including fluorescence lifetime imaging (FLIM). 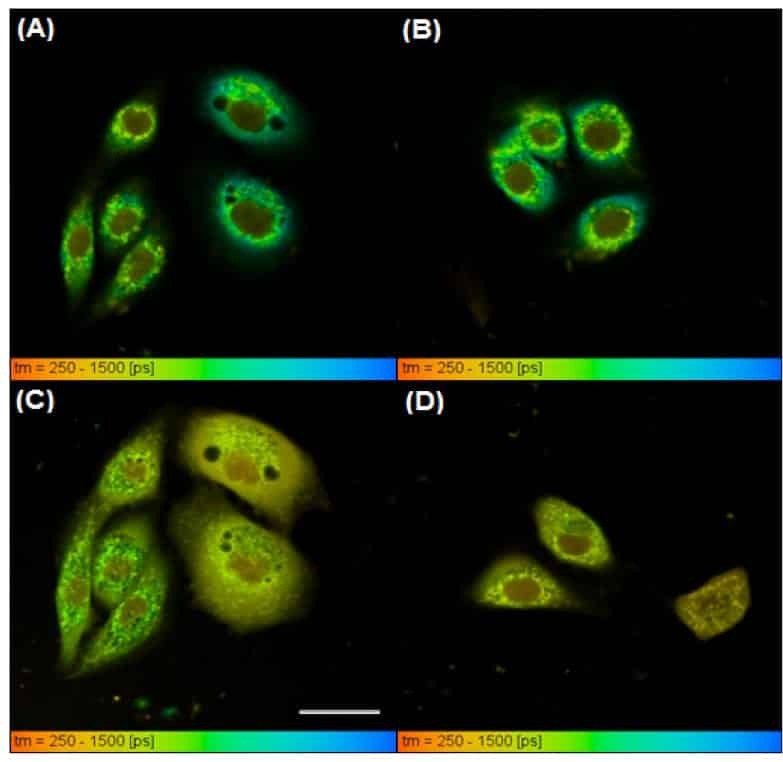 NADH lifetime images of untreated NOK (A and B) and NOK cells treated with KCN (C and D). White scale bar in (C) is 25 microns. The color bar indicates fluorescence lifetime in picoseconds (ps) with warmer colors showing shorter lifetimes. We are also developing multiscale and multimodal imaging for measurement of in vivo metabolism. Methods for imaging regional metabolism in vivo with 13C MRI and FDG-PET will be combined with existing optical imaging techniques using optical windows. I have already constructed implantable imaging windows for a group doing in vivo optical imaging of mice. By constructing windows out of MRI-compatible materials, mice can be imaged with both PET and MRI to provide multimodal, in vivo data that is more clinically relevant. We are determining correlation between metabolic information from cellular metabolism at the micro and macroscopic scales and the imaging modalities in this project will measure distinct metabolic parameters. Comparing metabolic imaging methods across modalities and scales constitutes not only a biological challenge, but also an engineering one, as the imaging platforms themselves need to be designed and built. Through collaboration between Medical Engineering at the Morgridge Institute for Research and the Department of Medical Physics we are uniquely poised to meet this challenge. Schematic of a prototype window designs tested in mice (A) and a picture of it transplanted into a mouse (B). A compression technique for stabilizing the window for optical imaging (C). Schematic (D) and picture (E) of a hybrid window. Picture of a first attempt at porting a window (F) and a CAD rendering of a newer, completely 3D-printed, ported window designed to be MRI compatible (G).